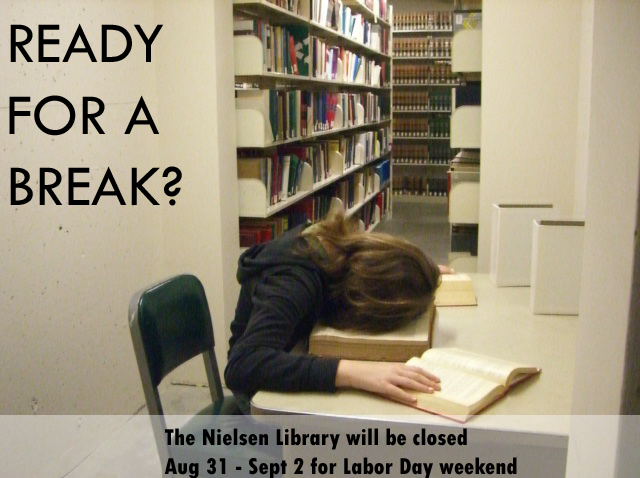 The Nielsen Library will be closed Aug 31 – Sept 2 for Labor Day weekend. 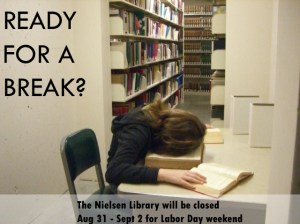 Normal hours will resume on Tuesday, Sept 3. ASU’s Computing Services implemented a new printing system over the summer, which allows students and staff to print directly from a laptop. You can send documents to over 20 printers around campus, including the printers in both of the library’s computer labs. To print wirelessly, you’ll need to login to https://webprint.adams.edu, select a printer, upload your document, and then release the print job. For complete instructions, view Computing Services How-To Page, or ask one of the librarians at the reference desk. Books: Entire semester. No item limit. Videos: Entire semester. No item limit. Laptops: 4 hours. 1 renewal. Library use only. Databases are accessible to anybody with an Adams State email address and can be used from any computer, whether it’s on campus or off. We can request books, articles, movies, and more from other libraries on your behalf. Items usually arrive within 1-2 weeks and can be picked up at the circulation desk on the first floor. Each librarian acts as a liaison to specific subject areas. Your liaison will work with you to purchase books for your subject. Liaisons can also help to find the best resources for students to complete specific assignments. Our librarians have created research guides with the library’s best resources for each subject. Your liaison would be happy to work with you to create guides for specific courses, or even individual assignments. The library staff will provide customized library instruction for any ASU class. Sessions can be held in the library, a computer lab, or your regular classroom. We’ll gladly set aside items for your students to use in the library for a period of one hour. Call or stop by the circulation desk for more information. The best resource the library has is its staff of professional librarians, and we’re here to help faculty as well as students. Stop by the reference desk or contact your liaison to find out what we can do for you. Books: 3 weeks. 3 renewals. No item limit. Videos: 3 weeks. No renewals. Limit 2. Reserves: 1 hour. No renewals. Library use only. Ask Academic Live Chat is staffed 24/7 by librarians who can help you with research and library resources. 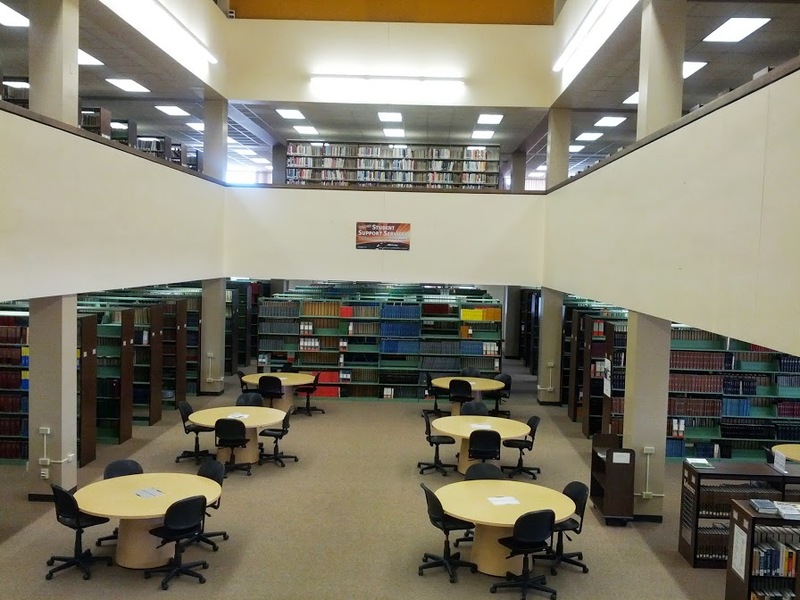 Located in the Nielsen Library, the SSC includes: Academic Advising, AmeriCorps, College Readiness, Disability Services, Grizzly Testing and Learning Center, Student Support Services, and Career Services. Computer labs are located on the 1st and 2nd floors. Both have scanners and black and white laser printers. The 2nd floor lab has 1 Mac computer. All other computers run Windows 7. 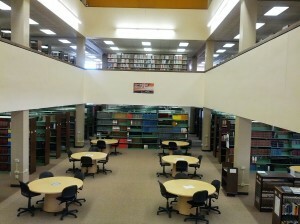 Individual and group study rooms are located on the 2nd and 3rd floors of the library. They are available on a first come, first serve basis. The best resource the library has is its staff of professional librarians. Stop by the reference desk for research help, one-on-one instruction, technology help, and more! We belong to a large library system called Prospector. It is possible (though not likely) that you may be able to get a textbook from another library in the Prospector system. Go to http://prospectorhome.coalliance.org/ to search for your book. Unless your class requires a brand new edition of a textbook, chances are you can save a lot of money by buying used books, either in the Adams State University Bookstore, or online. Many online book sellers offer deals on new and used textbooks. Save time by using a comparison service like textbooksplease.com or book.ly to compare prices on dozens of sites at once. A number of vendors, including the Adams State University Bookstore, now offer rental programs for textbooks. Check out the rental options and prices at Amazon, Half.com, Cengage Brain, Bookrenter, and ecampus. The Nielsen Library’s website has undergone a significant transformation this summer, and the new and improved version went live this morning. I’m Looking For… is where you’ll find links to our articles, databases, books, and other resources. I Need Help… has tutorials for using our most common databases, using the library, citing sources, and doing research. Information For… has information about library services, including checking out books, getting materials from other libraries, and getting reference help. About the Library has information about the library, including contact information, hours and location, and library policies. The homepage has the same address, but the addresses for other pages have changed, so you’ll want to update any bookmarks you might have. If you have any questions or comments about the new site, or just need help finding your way around, please fill out our Website Feedback Form.